—01. 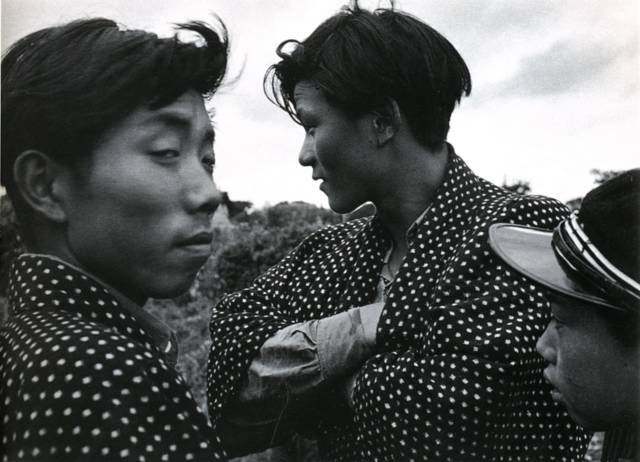 Kimura Ihei: Young Men, Niida, Akita City, 1952. I am glad to be here with you again & to be able to share some of my insight & daily inspiration! I decided to showcase the work of some of my favourite Japanese photographers. Although I am not considering myself as one, by producing the magazine, working on everything from the layout, interviews including the photography work, the pleasure to learn about your tools, working in various ways, the process of digging your own stuff (cameras for example) & learn about how it supposed to work is definitely something that I find exciting. —04.Ihei Kimura A Bride, 1965. Ihei Kimura established his studio, in 1924, in Tokyo and often travelled to Paris, first as an assistant to Werner Bichof but also after having been invited by Robert Capa and, then, in 1955, by Robert Doisneau. The Japanese photographer depicted the informality and beauty of everyday life in his country, mostly in black and white. In Paris, he decided to use color, capturing the festivities of the 14th of July, typical cafés and wanderers. Used to observing the French capital’s 1950s atmosphere in black and white, spectators are invited in an unusual colorful space that diffuses an almost surreal and magical feel that reminds us of when young children ask their grandparents if their life was in black and white in the old days. —03. Ihei Kimura Asakusa,Tokyo 1953. Featuring famous works from before and after the war as well as previously unpublished and unknown photographs, Teihon is the definitive collection of a master photographer whose works have been hard to obtain. The streets and the people of Japan’s Showa period come back to life in Kimura’s photos. A must-have item for fans, collectors and libraries, with a detailed chronological record [in Japanese] and location information for each photographs. —07.From "Self & Others" series, 1977. —05.Ihei Kimura Ginza, Tokyo, 1954. —06.Gocho Shigeo, self portraits, 1977. —08.From "Self & Others" seriess, 1977. First published by Miraisha in 1977, Shigeo Gocho's 2013 re-publication of the iconic Self and Others is a photobook provides the opportunity for viewers to both revisit and be introduced to the seminal body of work by Shigeo Gocho. Having lived a short but remarkable life from 1946-1983, Gocho's photographic works stay available within the public realm in only three photographic publications. Amongst his photobooks, Familar Street Scenes (1981) and Days (1971), it is Gocho's Self and Others which presented a highly intimate reflection of the photographers own life and experiences. —09. From "Self & Others" series, 1977. —10. From "Self & Others" series, 1977. Shōmei Tōmatsu (東松 照明, Tōmatsu Shōmei, January 16, 1930 – December 14, 2012) was a Japanese photographer.Born in Nagoya in 1930, Tōmatsu studied economics at Aichi University, graduating in 1954. While still a student, he had his photographs published by the major Japanese photography magazines. He entered Iwanami and worked on the series Iwanami Shashin Bunko. 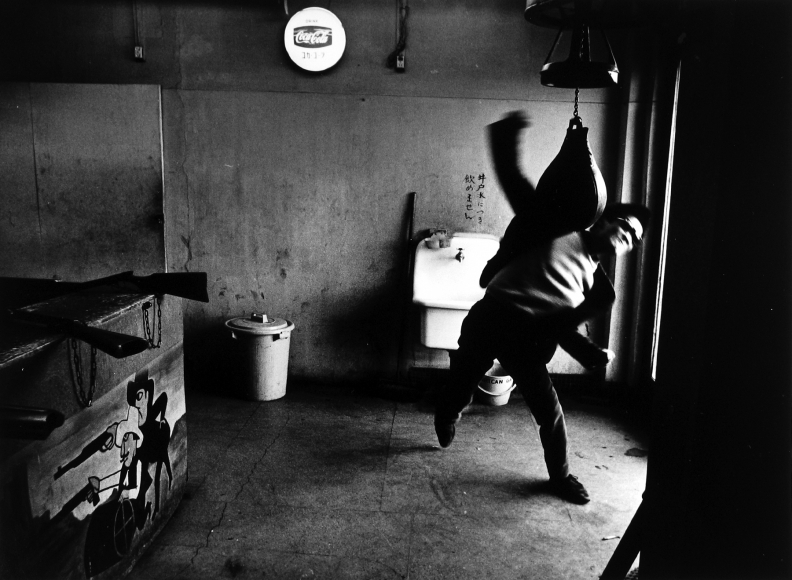 Two years later, he left in order to freelance.In 1959, Tōmatsu formed Vivo with Eikoh Hosoe and Ikkō Narahara. Two years later, his and Ken Domon's book Hiroshima–Nagasaki Document 1961, on the effects of the atomic bombs, was published to great acclaim.In 1972, he moved to Okinawa; in 1975, his prizewinning book of photographs of Okinawa, Pencil of the Sun (太陽の鉛筆, Taiyō no enpitsu) was published.Tōmatsu moved to Nagasaki in 1998.Tōmatsu died in Naha (Okinawa) on 14 December 2012 (although this was not publicly announced until January 2013). —13. Chewing Gum & Chocolate, Yokosuka, 1964. —17. Children attending the School for Children of Boat People, Tokyo, Japan, 1956. —14. Untitled (Ishiki, Aishi), 1959. —16. Untitled (Yokosuka), from the series "Chewing Gum and Chocolate", 1966. Culture, riding a mushroom cloud, came in from across the sea,’ wrote the Japanese photographer Shomei Tomatsu in 1959. From the 50s to the 70s, he travelled Japan photographing US military bases to show the Allied occupation of his country, and the fascination and repulsion he felt about it. Moriyama is one of the key figures associated with Provoke (1968–70), an influential photography magazine that rejected photojournalistic conventions of objectivity and clarity.Daido Moriyama has a self-proclaimed addiction to cities. At age 73, his work still shares the same inclination to record his surroundings as his earliest pictures, taken during the dramatic transformation of 1960s post-war Japan. Moriyama used his camera to document the American military occupation of his country and the dissolution of traditional values experienced alongside accelerated modernization. In a process he maintains today, Moriyama shot with a small hand-held automatic camera, rarely with attention to the viewfinder (firing his shutter as if by machine gun.) In his depictions of city life, Moriyama documents cultural change and chaotic urban experience, typically in grainy, black-and-white, high-contrast images, which he prints himself. Early influences include photographers Eikoh Hosoe, Eugène Atget, Weegee, and William Klein, all who shared a similar affection for the dynamics of city life. Memories Of A Dog The photographs of Daido Moriyama. —21. New Japan Scenic Trio 2: Ueno Terminal Station, 1982. —22.Memory of Dog 8, 1982. Published to coincide with Daido Moriyama's restropective held at the National Museum of Art in Osaka 2011, On The Road is the published works of several of Moriyama's most well known images. Included within are portraits and images from his Record series, Tales of Tono 1974/76, Japan Theatre 1967/68, Actor Shimizu Isamu 1967, Daido Hysteric, Colour, and Shinjuku 1968.The images reflect what was to become Moriyama’s iconic perspective in capturing his surroundings. The black and white photographs assembled along the pages of the photobook reflect a stream of thought provoking instances, encounters and experiences. Here amongst the images of famous actors, past travels, and urban street scenes of 70s Tokyo, On The Road resembles a visual narrative of Jack Kerouac’s same named novel. The journey rather than the destination resonates throughout all of Moriyama’s works taking the viewer along his own wanderings and explorations of accidental occurrences and meetings where every moment has its own found pleasures and lifes incidental encounters become a succession of visualized memories.